His truck had plowed into the bumper of our 2002 Toyota Corolla and come to rest in the backseat. Thanks to his quick reflexes, my husband steered us away from the car traveling ahead of us, back across two lanes, and onto the berm of the road. Only mildly injured, we insisted on completing our mission, leaving our totaled car on the highway. A policeman transported us the few miles to the funeral home and deposited us in the parking lot with our caved-in suitcase, demolished laptop, and box of busted framed photos of my mother-in-law. To get back home to central Pennsylvania, we rented a car, which we drove straight to our Toyota dealer. There we faced a dilemma. Would we replace the car with another fuel-efficient Corolla, or would we opt for a bigger car—more metal to shield us from future dates with a tractor-trailer? Bigger meant increased fossil-fuel emissions. This was against the credo we’d been cultivating for some years—me as a magazine editor who was trying to make her publishing practices more sustainable, he as faculty adviser to a social-action club trying to jump-start a recycling program at his community college. Since our last car purchase there was a new, appealing option—a Camry hybrid. Yes, it would cost us several thousand dollars more than a standard Camry, and yes, we would never recoup that money, despite our gas savings. But the $500 rebate the state of Pennsylvania offered hybrid purchasers was appealing. So we took the plunge. Two years ago, my own mother died, and one of the objects I inherited was a 2001 Avalon with 60,000 miles—the veritable little-old-lady’s car. Despite its thirsty engine, we decided to keep it for a while, then replace it with a hybrid. My husband, with the longer commute, would drive the fuel-efficient Camry, and I would soothe my conscience by vowing to drive the Avalon as infrequently as possible. Hence the sight of me—sweaty in the summer, cold now as we move into winter—on my navy Trek bike in my ungainly pedal up the College hill to my office in Sproul Alumni House. Like many other faculty and staff at the College, I’ve decided I can rise a little earlier than I would if I were driving and do my small bit to cut down on carbon emissions. The trade-off for the mild discomfort has been an increased fitness level and ramped-up immune system, which makes me a healthier and more energetic worker as well as a more sustainable one. But what about those publishing practices? When I arrived and discovered that the paper we were using for the magazine was only 10 percent postconsumer recycled, I asked our printer to explore other options. We now print on 30 percent postconsumer recycled. Yes, it’s a little more expensive, this Opus Matte, but its texture actually is nicer, and it’s a brighter sheet, which better showcases our photography. I’m also exploring ways in which we can better meet the needs of some of you readers who have asked to be dropped from the subscription list to save paper. 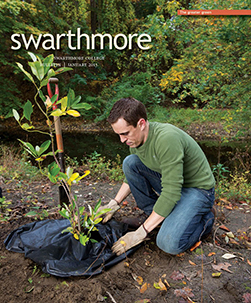 In the next year, I’ll take steps to make the online edition more available to readers who choose to opt out for sustainability reasons but who still wish to receive their full complement of Swarthmore news, including class notes, which currently are not online due to our concern about making personal information available to anyone handy with Google. I’d love to hear your own tales of sustainable living and your suggestions on how we can be a more sustainably responsible publication. 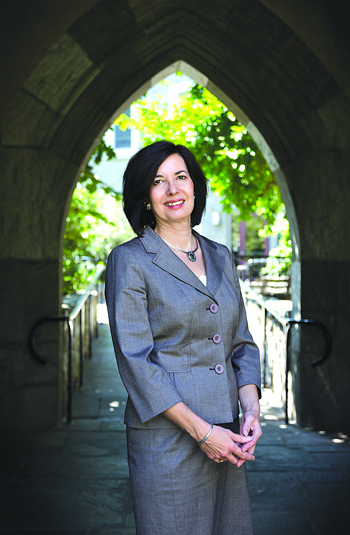 Please write me at skimmel1@swarthmore.edu.